Budapest, the capital of Hungary is a city with lots of culture and lots going on to see and do. Alike many capitals within Europe you have historical buildings to visit and pretty landscapes to experience. However we found Budapest different to any other capital city that we have visited before. This is due to the historical culture of medicinal baths and buildings that we was able to visit around the city. The city of Budapest was once separated in two, with Buda on one side of the river and Pest on the other. During our visit we stayed on the previously named Pest side of the river which is easier to get to from the airport and is within walking distance of one of the famous historical baths. Come and explore what Budapest has to offer . . .
Hungarian Parliament building: This pretty building which sits upon the river is the Hungarian house of parliament. Stunning from the outside, you are able to get the best views of the building from the other side of the river. You are also able to go for guided tours within the building, however it is recommended to pre-book to secure a place and tours can be cancelled or unavailable during parliament meets and events. 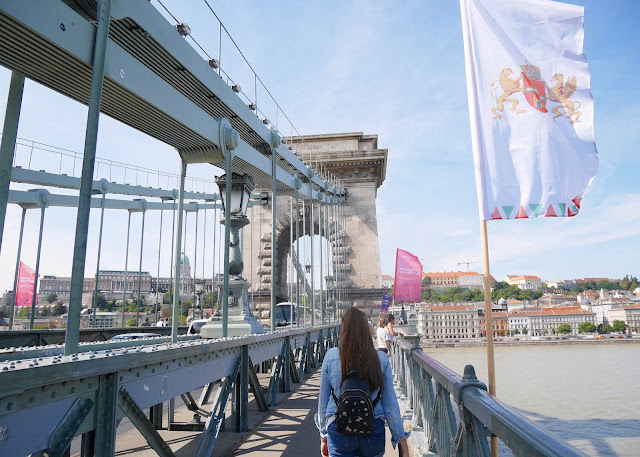 Szechenyi Chain bridge: This is the pretty bridge located within the centre of the city which enables you to get from Buda to Pest and vice versa. The bridge allows you to cross either by car or by foot/bike. Being only 375 metres long the bridge does not take too long to walk across and allows you to see the pretty city from different angles. Tip - If you don't fancy the walk to the top of castle hill to visit Buda castle, Fisherman's bastion and Matthias church you can use the tram. Matthias Church: This catholic church located within the Buda castle district is well known and well visited not only for its location next to Fisherman's Bastion but also for its breath-taking architecture. The historic church which has been designed to look like a traditional gothic church has the addition of coloured tilled roofs. Open to the public you are able to venture inside to experience the architecture inside as well. This doesn't require pre-booking, you are able to decide on the day as long as you visit during opening hours. Fisherman's Bastion: This is a terrace which is located at the top of the hill where Buda castle and Matthias church sit. Due to the location of the terrace you are welcomed by the best views across the city and the river which runs between Buda and Pest. The fisherman's bastion terrace is surrounded by fairy tale like towers and walls with open windows. These used to be castle walls for the castle on the hill. Today the walls remain but are not to keep people out of the castle grounds so can therefore be explored and admired. The sight is free to walk around and explore unless you want to walk around the higher up viewing platforms where you can buy a ticket for on the day. Szechenyi Thermal Baths: The thermal baths are a big attracting in Budapest due to their thermal springs. Now over 100 years old the baths are still today used for medicinal purposes as well as for relaxation. Open to the public, you are able to enjoy all 15 inside baths and 3 outdoors at your own free will. The baths also offer massage and facial treatments which you can book prior or upon arrival. Make sure you check the pool temperature before you get in as some of the pools are cool pools at only 20 degrees and some are warm at 38 degrees. Although we found 20 degrees comfortable to be in, it can seem rather cold after being in another pool. Tip - Buy a cabin so you can change in private and not in a communal changing area. Have you ever been to Budapest? What would you recommend visiting? i just returned from Budapest. Wish I had seen your post before I left. Great ideas!